Uniforms and color guard costumes add to the drama and spectacle of every drum corps performance, and for the designers and manufacturers, the season starts on the drawing board. You've heard the music on the field; now meet the people behind the notes. DCI Magazine spoke to leading drum corps composers and arrangers and asked them to tell us the "score." From regular stints on the Martha Stewart show to developing programs for children with autism, former Cadets member Kathy Santo has built on the competitive discipline she learned in drum corps to become a leading dog trainer, teacher, author and entrepreneur. 2008 World Championships wrap-up, 2009 audition info, the latest gear and accessories for marching musicians, and more. 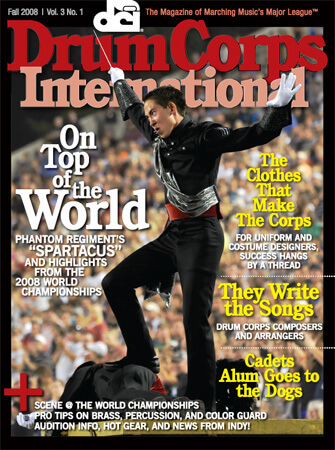 Subscribe to Drum Corps International Magazine.